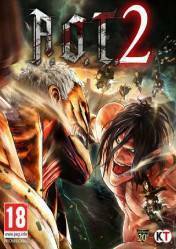 Attack On Titan 2 (AOT 2) is the second installment of this adaptation of the famous animated series in which the remains of humanity are hidden behind high walls that protect them from the fearsome titans, enormous creatures and with a hunger for atrocious humans. In Attack On Titan 2 (AOT 2) the series will be represented even more faithfully, along with an evolved action system that will offer greater versatility and deeper, more dynamic battles. It also introduces new concepts such as the sections, which provide a brief respite to characters where they can enjoy ordinary life between battles. We can also use this time to develop relationships or to train for our next mission. We will also have available the Titan Investigation Room, which will allow us to see the Titans we have captured using a containment pistol, as well as gather detailed information that will be very useful for future confrontations. We will also be able to develop and evolve our weaponry, modernizing the gas system, blades, as well as our skills. Game is great but overall experience is ruined by constant crashing and freezing. I cannot recommend this game right now because of this reason. I will change my recommendation once this issue gets fixed.